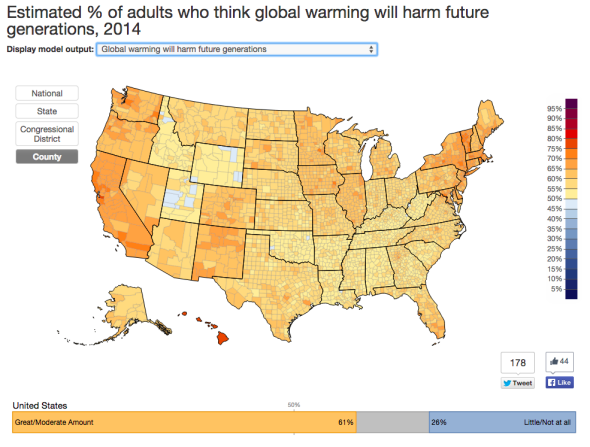 New climate change poll shows Americans believe in global warming. A large majority of Americans believe in global warming and are ready to take action, according to new polling data. 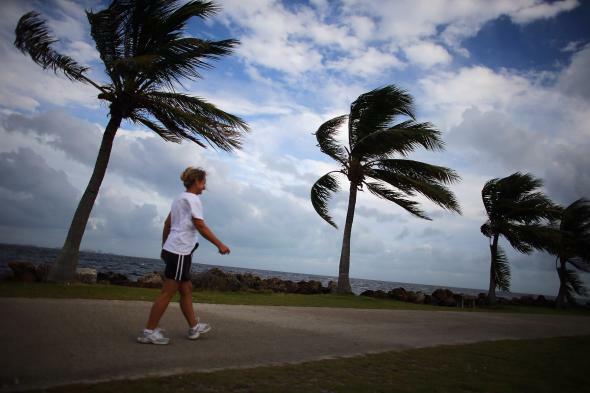 Here, the outerbands of Hurricane Sandy are felt on Oct. 24, 2012 in Miami. On Monday, researchers from Yale and Utah State University unveiled a new statistical technique that allows an in-depth accounting of Americans’ attitudes toward global warming. The resulting maps—down to the county level—reveal some interesting takeaways. 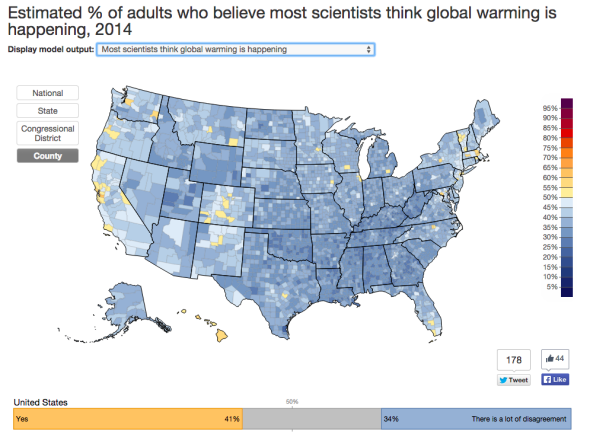 First, Americans overwhelmingly agree that global warming is happening. Out of 3,143 total counties in the United States, majorities of just 39 counties disagree. That means nearly 99 percent of all counties in the country “believe in” global warming—with the holdouts confined to deeply conservative places like Limestone County, Alabama, or coal-producing Putnam County, West Virginia. That aligns broadly with a recent 98-1 Senate vote that global warming is real and “not a hoax.” The lone holdout in that vote was Mississippi Sen. Roger Wicker. Looking at the science, perhaps climate denial in Mississippi and Alabama can be expected: According to the recent National Climate Assessment, they’re the only two states that haven’t warmed significantly over the last two decades. The most recent report from the Intergovernmental Panel on Climate Change, the world’s most highly regarded body of climate scientists, was emphatic on this point, saying it is now “extremely likely” that humanity is the dominant cause of global warming. The new polling data show Americans seem unconvinced by scientists in general, with majorities of 3,061 of 3,143 counties (more than 97 percent, including Mendocino County, California, and Bergen County, New Jersey) disagreeing with the statement that “most scientists think global warming is happening.” In fact, 97 percent of climate scientists believe climate change is real. A lot of this disconnect between public opinion and scientific consensus can probably be traced back to the intense politicization of climate science in recent years, funded largely by interests within the fossil fuel industry. Climate change is now the single most polarizing issue in America. That’s clearly shown in the new poll’s assessment of how Americans feel about the risks associated with global warming: Residents of more than half of U.S. counties aren’t worried about climate change (1,951 of 3,143, or about 62 percent, including Santa Rosa, Florida, and Ashland County, Wisconsin). 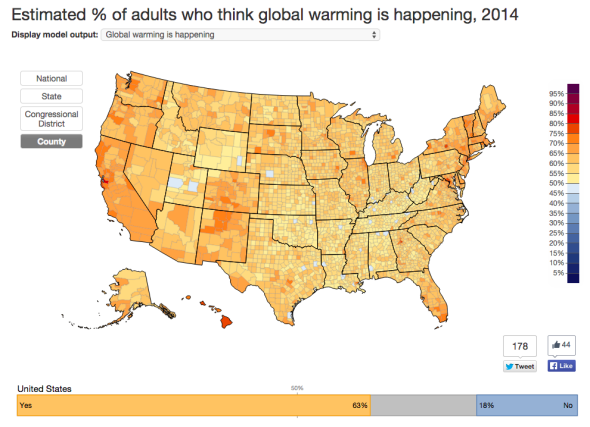 Worse: There wasn’t even one county in which a majority of respondents believe global warming will harm them personally. In sharp contrast, majorities in 3,122 of 3,143 counties (more than 99 percent) do agree that future generations are at risk, with those responding in the affirmative hailing from places like Sheridan County, Wyoming—in the heart of coal country. Despite the fact that Americans seems to think of global warming as an issue that will affect mostly future generations, they also realize it requires current efforts to address. Americans are still firmly committed to action on climate change right now, the new polling data suggests. Respondents seemed to strongly prefer “big government” solutions focused on increased regulation and executive action, and are lukewarm to market-based policies like a revenue-neutral carbon tax. -Every single county believes we should fund research into renewable energy. -Every single county believes we should regulate CO2 as a pollutant. -Nearly 99 percent of counties (3,104 of 3,143) agreed with a requirement that utilities should produce 20 percent of electricity from renewable sources. There’s a lot of optimism to be found in these results: Americans are largely willing to take action on climate change, even if they think it won’t affect them personally. Heading into a major election year, that’s something to be encouraged about.